I have a confession to make. I have never been too overly excited about our Groups and Committees feature of HOAInTouch. I mean, it worked but it just felt a little “off”. The interface always seemed a little clunky and inefficient - kind of like it was bolted on instead of being a first class feature of the application. I must admit it was my least favorite part of the application and, while we haven’t received any specific feedback on it, the usage statistics appear to confirm that our customers agreed. So we decided to throw it out and rebuild it - nearly from the ground up. 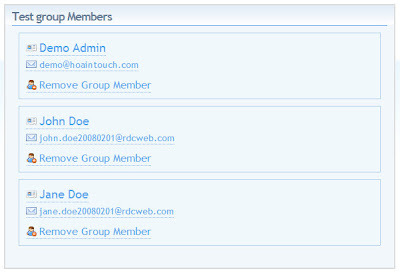 I am very pleased to let you know that tonight we released a new Groups and Committees module of HOAInTouch. This release contains several new features – namely public groups and group member titles - as well as improving on existing features by improving ease of administration and usability. Let’s take a look at the improvements to existing functionality and then we will present the new features. One of the biggest annoyances with the original design was that the group details and group members were on separate pages. This never really made sense and required residents make an extra, unnecessary mouse click to view basic group information. To help illustrate the issue, below are screenshots of the group details and members pages before the update. As you can see, the group details page was pretty thin in terms of content. Frankly, there was no new information presented that wasn’t already available on the groups homepage. Additionally the group members page wasn’t much better. We were consuming quite a bit of space to communicate a small amount of information. Yuck. So the first thing we set out to improve was the presentation of the group members. We wanted a way to provide more information in less space. After tossing around a few design ideas we settled on a tabular grid format. Not only does this design provide a concise means of displaying the data, it also allows residents to sort the data thereby greatly improving usability for groups with many members. With the new design taking up so much less space we decided to merge the group details and group members pages - thus eliminating the extra click to get to the member information. Yes, it is a small change but I feel strongly that small details like this really matter and are what separates a good application from a great one. Below is a screenshot of the new group details page. I am really happy with how it turned out and I hope you agree! In the original design we allowed anyone to update the group description and add or remove group members. With the new ability to create public groups (more on this later) we thought it was best to move all of the group administration functions into the Administration section. 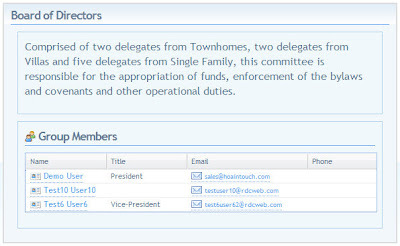 This move not only makes it much easier and quicker to manage groups but also ensures that community administrators maintain appropriate control over group details and members. Below is a screenshot of what the Add Group Member widget looked like in the original design. And this is the new design for editing group information and group members respectively. Much cleaner, much nicer, much better. 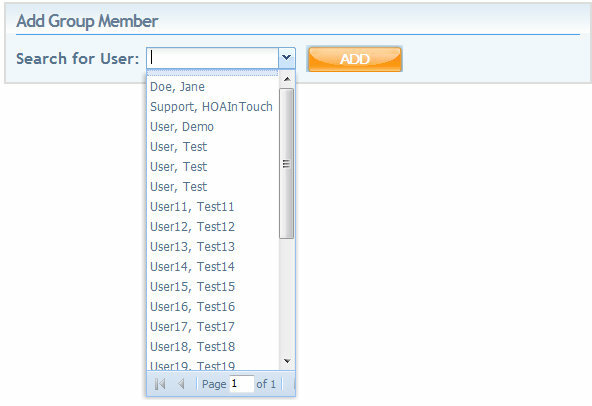 One area of the Groups and Committees module that we have received quite a bit of feedback on is the lack of visibility of groups for guests/visitors and neighborhood residents not signed in to the HOA website. For example, several communities requested the ability to allow any visitors of the website to view their Board of Directors committee so that potential homeowners could contact them with any questions they might have. I am pleased to announce that Groups and Committees can now be marked as public which will allow visitors and residents not signed in to view the group details and members. 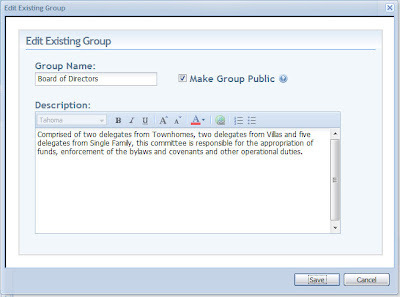 See the new Edit Group Details screenshot above to see how to enable this feature. 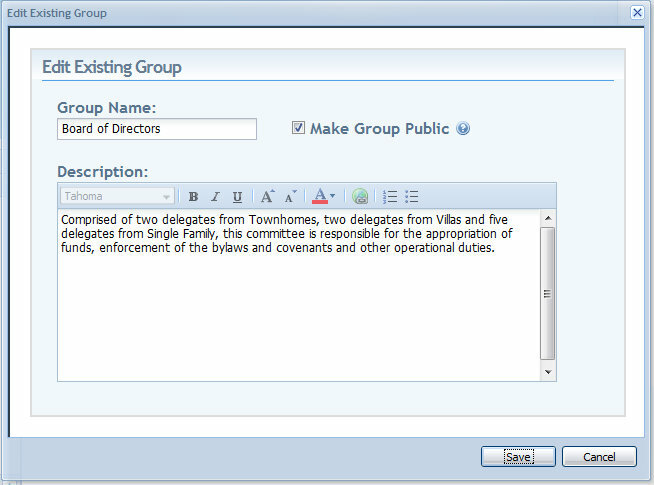 Lastly, we added the ability for community administrators to add a title or role description to each group member. This will greatly assist residents in understanding how each group member fits into the larger group/committee and who they might need to contact with issues or questions. Refer to the new Edit Group Members screenshot above to see this new feature. Overall this was a pretty significant release – one of the largest since we initially launched in November of 2006. I dramatically better about our Groups feature and can now consider it a first class feature of the system. I hope you agree but either way let us know what you think! Thanks and we will see you ‘round the neighborhood!